I've looked at some web sites like batch pcb, express pcb, et al. Anyone here have opinions about the quality of boards from places like this? I'm more interested in quick response than price (to a point obviously), and I don't mind having to get three copies of a board. However, I would like to be able to send Eagle files rather than learn a new program (especially if it only runs on Windows). You don't need to learn a new program - just use the post processing (cam) jobs from Eagle to generate Gerber files. The only place that I know off, where you can get PCB's made from Eagle files is Olimex in Bulgaria. If you're willing to pay for delivery by courier, it usually takes from 3-5 days of processing time plus 1-3 days for the courier transport - is that fast enough? (I don't think you'd get it any faster if you used a local manufacturer - au contraire). This is, if you stay with 10 mil or wider. If you need to go to 8 mil, add a couple of weeks. Get the Eagle scripts from their site to check the PCB and try to keep through holes to a minimum number of different sizes, for the lowest cost. The quality of the PCB's from Olimex is very good. Unless you're an experienced PCB designer ace, it may be a good idea to post your PCB files here for tips and advice before ordering a PCB from them, as there are many pitfalls. Of the many PCB designs I have seen (here and on other hobbyist sites), I have not seen a single that couldn't be improved in some way and most of what I've seen really needs to be improved. It's annoying to find the weak spots after you paid for the manufacture. Did you consider making PCB's yourself? you don't say what country you live in. for anywhere in Europe i would agree with Soeren that Olimex are one of the better options. they are a little eccentric to deal with (you need access to a fax machine for payments...) but they are helpful and used to dealing with hobbyists. if you need traces smaller than 8 mil then http://www.eurocircuits.com/ are good too. i believe if you are in Asia or the Americas you will find a quicker option closer to home. That's way out of my league. I'm just thinking about making a few boards because I wind up soldering very similar setups on perfboard, and I'm getting tired of that. I was hoping to get some feedback here. I'm not very well versed in electronics, and I haven't been able to get a schematic done in Eagle for what I'm thinking about yet, so I'll take all the help I can get. Yes, but I don't think I have the time for it right now. My day job is keeping me pretty busy. I've heard some good things about ExpressPCB. I may go ahead and submit to Windows to use their software. 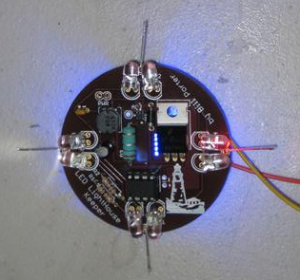 I'm looking at doing a PCB of something like the attached picture I like the ATtiny84, and this setup works for me. With the power supply, ISP header and headers it takes me most of a Saturday to put one of these together. I'm in the USA. Not sure what I need yet apparently. I thought I was close but I'm not sure what the tradeoffs are with what you're talking about here. After trying the SparkFun's Batch PCB service (a good choice for a one (many times you get an extra one) board) I needed to get more identical boards for a project. I have found SeeedStudio's Open PCB service and I was very happy with the boards quality and price. But there is even a cheaper similar service, the iTeadStudio's Open PCB service. For only $12 (plus about $3 shipping) you get 10 boards up to 5x5cm (2x2inch) size. That's a dollar and half for one board! Good quality, they look professional and are easy to use. The only drawback is the waiting time, about 4 weeks from the day you place the order. I used Eagle CAD to design my boards and boards for Tiny84 and for Tiny85 are on my to do list. If you further need my help, just ask. I also suggest looking at dorkbotPDX. I've used them a fw times with no problems, and it usually takes 1.5 weeks to get it from the run date. China has a lot of goods on the PCB, because they are of good quality and very cheap. So, the general order I will give some of the manufacturers in China. Cooperated wellpcb manufacturers, board quality is also good. If find other good manufacturers, after may be considered.